An easy recipe for Sloppy Joe Casserole, perfect for those times when you want to eat Sloppy Joes on a fork instead of on a bun. 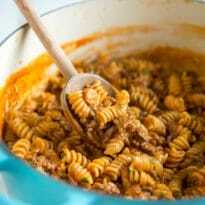 Based on my wildly popular Sloppy Joes recipe, it's made all in one pot and ready in 30 minutes or less, start to finish. Perfect for busy weeknights and wickedly delicious! Pour sauce ingredients over drained beef and stir until evenly coated. Add broth and pasta. Bring to a boil, and cook until pasta is tender, about 10-12 minutes. Garnish with parsley, if desired. Serve.